If the recent flurry of yellow buses rolling around town is any indication, the sullen looks on your kids’ faces are the confirmation – school season is back. The school year always brings a certain level of madness, especially at the onset. The change in daily routine can be particularly rough on your children, and the best way to smooth out the transition is to stay organized. 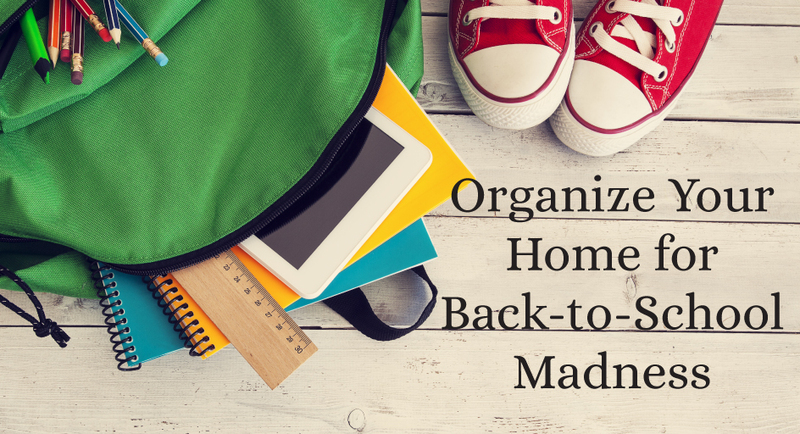 Here are some organization tips that are sure to keep everything in order this school season. Although it is highly unlikely that the goal of the Gregorian calendar was to facilitate a less hectic school year, the fact remains that it is a tremendous resource for families with children in school. Often overlooked, a large and easy-to-find calendar in your home can make a world of difference in daily, weekly, monthly, even yearly happenings in your home. Not every family has matching schedules or routines – a calendar is the perfect tool to let everyone know where everyone should be throughout the week. There is no one-size-fits all option for a successful calendar; as long as it is easy to find, update and read your family with always be informed on everyone’s plans. August is the common time where everyone realizes all the supplies and clothes their children need are in short supply around the home, including retail stores. Prepare to be inundated with mailers, flyers, radio and TV commercials, and emails promoting endless “back to school” sales that you should always take advantage of. Even though there will be no shortage of savings, it is still in your best interests to plan out your shopping excursions beforehand. Evaluate the needs of each of your children in both the clothing and supply department. Pay attention to any supply lists you might have received and take a full inventory of closets and drawers. Be sure to donate any clothes that your kids have outgrown! Anyone with kids in school will tell you that mornings can be quite an adventure. While it is certainly true that some households experience a fret-free and calm environment in the morning before school, some homes are not so lucky. For those whose homes feel more like an IHOP kitchen on National Pancake Day before school, the best thing you can do to combat the madness is establish a routine. Keep in mind (especially if you have multiple children) that routines are not universal. Some people have no problem popping out of bed fully energized in the morning, while others require a little (or a lot) more time. Bathroom schedules, breakfast plans and clothing selections are all parts of the morning rush that can be planned out the night before. to learn more about our customized floor plans, communities, and more. Homeowners interested in purchasing a home from Eastland Construction, Inc., please contact our preferred realtor, Debbie Melvin at 615-754-0200.